For anyone wanting to learn a language in the 1970s, there was one person who would be guaranteed to be able to help: The Man With The Golden Tongue. Dr K. P. Sivam picked up this nickname when he sold language courses for a living. As sole distributor for the Linguaphone Institute of London, he offered neatly packaged kits comprising guides, textbooks and audio cassettes from his second-floor office at a shopping mall based at the site where the Mustafa department store now sits. "Things were going well," said the 81-year-old grandfather, who would sell 100 sets in a good month. "I worked with a small group of staff at the shopping mall. We had offices in Malaysia too." Of the 25 courses available, the most popular language was English as the Government was promoting its use at the time. 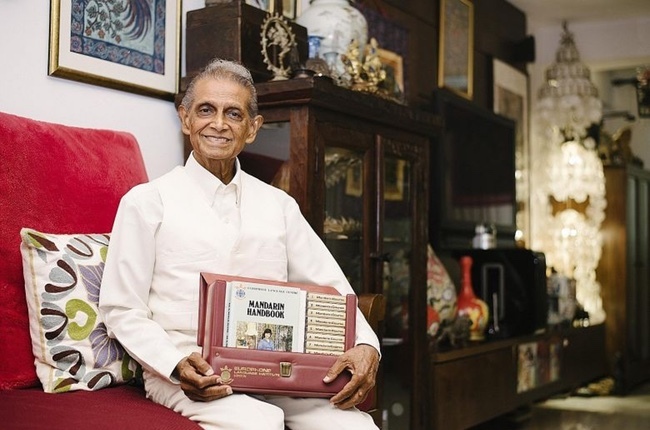 "Mandarin was next - this was the time when people of various dialects were encouraged to learn Mandarin," said Dr Sivam, who is fluent in English, Malay and Tamil, and also knows Latin. He developed his love of languages at a young age but chose a career as a civil servant at the Singapore Customs, after turning down an opportunity to study dentistry in university in 1955. He was among just four of 100 candidates selected for the senior officer's role in a department which had a staff of about 1,500. "Government jobs were prestigious," he said. "Perks included a government loan to buy a new car and low rental for a series of four-room flats built especially for senior officers in Wallich Street." He was part of the prevention arm that stopped smuggling activities and, over 12 years, Dr Sivam rose through the ranks to become superintendent. In 1967, he left the civil service to join his father in a cosmetics business venture. It is innate in many of us to want to know the philosophy and the deep knowledge that is available today. The world is our classroom and our classrooms are windows to the world. "My father bought a franchise company," he said. "Back then, we went house to house to sell our products." For more than two years, he trained staff and helped run the company as a general manager. As his father's franchise was phased out, he took a radical turn in 1972, venturing into the publishing industry as a language course provider. When his own Linguaphone franchise was eventually bought out around five years later, Dr Sivam decided to set up his own language course company, the Europhone Institute, offering similar language courses which he created himself. With his experience, Dr Sivam became familiar with language structures and worked with native speakers to create and publish the learning materials and cassettes in various languages. "After distributing products at Linguaphone, I learnt the whole concept and I produced my own, using local facilities like recording studios," said. "For example, I studied Mandarin and I was able to guide the writers. "We had offices in Singapore and Malaysia, where we sold directly to customers who walked in. At the same time, we retailed the products to about 50 bookstores." Dr Sivam was president of the Publishers Association from 1994 to 1997. While publishing language books, he pursued a master's in mass communication, an MBA in business management and eventually a PhD in business management. "Initially I only had my A levels. But I realised that I needed something more as the world was changing and so I went back to study," he said. Dr Sivam pursued part-time studies for about a decade, including courses to help him become a lecturer. "Each time I passed something, I didn't stop. I went on to something else," he said. "I qualified to teach very early. "I wanted to be highly qualified because that gives you more teaching opportunities. And you become a specialist and an all-rounder." In 1994, Dr Sivam also started teaching mass communication subjects at the Management Development Institute of Singapore (MDIS) business school on a part-time basis. As he phased out his language-course venture, he started teaching at more institutions. "I was given the opportunity to teach undergraduates and graduates from 1996 up till 2014," he said. After that, Dr Sivam became a marketing consultant for MDIS, where he still advises on advertising and public relations activities. He recently picked up stock market knowledge through talks, seminars and self-learning. "It is innate in many of us to want to know the philosophy and the deep knowledge that is available today," he said. "The world is our classroom and our classrooms are windows to the world."